Don’t assume a blow-up banner is the quickest way to set up a race. 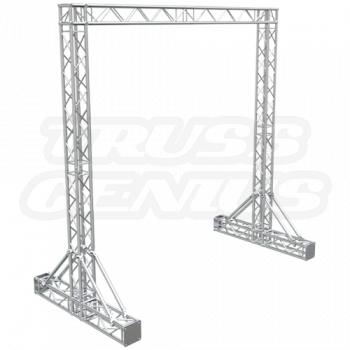 Our corrosion-resistant truss solutions are ideal for outdoor use. Plus, they’re just as portable and easy to install. Order our modular finish line design and take your sporting event to a whole new level. Race participants need motivation and something to push towards. Likewise, spectators tend to get more involved alongside a flashy finish line. This kind of setup fosters excitement and energy. Better still, it provides a solid backdrop for sponsor banners and logos. We offer a wide selection of sizes and goal post shapes, including square, triangular, octagonal, rounded and arched. We’ll also help you incorporate all necessary add-ons, including camera equipment, lighting, time clocks and sensors.